Our range of products include cyclone vacuum cleaner and metal chip vacuum cleaners. The Cyclone Vacuum Cleaners of the AMSC-series are the result of years of experience in combination with scientific research discoveries. 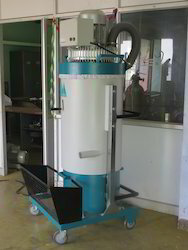 These units make it possible to efficiently separate dry and pourable dust from the air stream so that only the fine dust needs to be filtered out by the subsequently connected dust extractor. The use of Cyclone Vacuum Cleaners can significantly increase the filter life of the dust extractor thereby reducing the operating costs. Altomech is so sure of the efficiency of this technology that we will guarantee the performance of the equipment. For special applications, the AMSC - Cyclone Vacuum Cleaners are also available as a stand-alone filtration unit with a fan installed on top of the Cyclone Vacuum Cleaner. The optimal solution for extracting medium sized and coarse dust. Effective dust extraction with filtration efficiency guarantee. 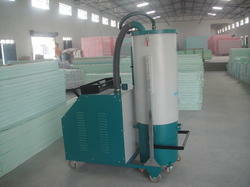 Ideal in combination with other Altomech dust extractors. Primary filtration unit or pre-separator unit. Dry, pourable types of dust. Our Metal chip Vacuum Cleaners are multi-utility vacuum cleaners and have the adaptability for customization.These vacuum cleaners are designed for the collection of coarse particles, such as chips and granules.The vacuum container collects and holds a large volume of material.